Following up from the first public beta of iOS 11 earlier this week, Apple is now doing the same for macOS High Sierra. The company announced the next major update to its desktop operating system at its Worldwide Developers Conference earlier this month, promising several enhancements under the hood designed to speed up devices as well as refreshed apps and new features. The final version will be available this fall but as of today anyone can get an early peek without the need for a developer account. All you need to do is sign up for Apple's beta testing program and the macOS High Sierra beta will be available through the Mac App Store. Keep in mind this is beta software and though macOS updates are relatively stable once they get a public beta release, you are still bound to encounter freezes, crashes or incompatibility issues with some apps. Needless to day, you shouldn’t install it on you primary machine, and if you decide to give it a go be sure to backup you machine first in case anything goes awry. Among the more visible changes in High Sierra are a few improvements to Photos, Safari, Mail, Notes, Siri and Spotlight. Photos is getting better editing tools, new Live Photos tricks, a smarter Memories feature, and support for printing albums using third-party services like Shutterfly and Wix. Meanwhile, Safari has a new autoplay blocking feature for videos and Intelligent Tracking Prevention, which relies on machine learning to remove cross-site tracking, and more granular controls over content blockers and privacy for your Mac’s camera, location, microphone, and notifications. Mail is making search smarter with a Top Hits feature that will factor in things like how many time you’ve seen a message and how often you interact with that person. The updated Mail app should also take up to 35% less space by compressing all of your messages. Notes now supports pinning and adding tables to notes, Siri is better at music related requests and — like iOS 11 — adds support for more natural voice options, Spotlight can now track flight status, Messages are now stored in iCloud, Universal Clipboard now works across Macs, and iCloud storage can now be shared between up to six family members in all but the base $0.99 per month option. The most important changes are under the hood, however. First and foremost Apple is revamping macOS's file system for High Sierra, replacing the old HFS file system with the new APFS (Apple File System) that is expected to vastly improve performance. A short demonstration at WWDC consisted of duplicating 7GB worth of video files, in which Sierra took about ten seconds, while High Sierra did so almost instantly leveraging the new file system's capabilities. The new macOS is also optimized for the newer HEVC video standard. 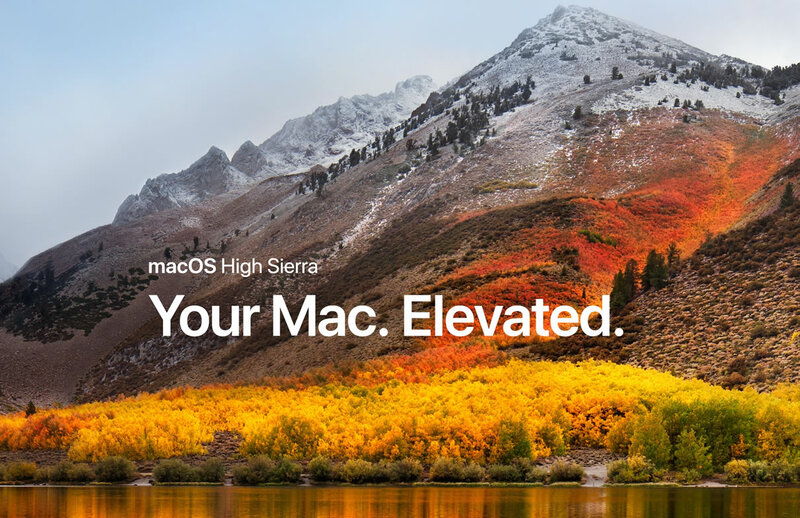 High Sierra will have no problem displaying on Ultra HD monitors and offers built-in hardware acceleration for the new Macs coming out, which all feature Kaby Lake CPUs.